Perhaps it was nerves, but the Redhawks (18-15) just seemed off. The Redhawks shot just 32.3 percent from the field and were outclassed by the No. 2 seed Ducks in every phase of the game. 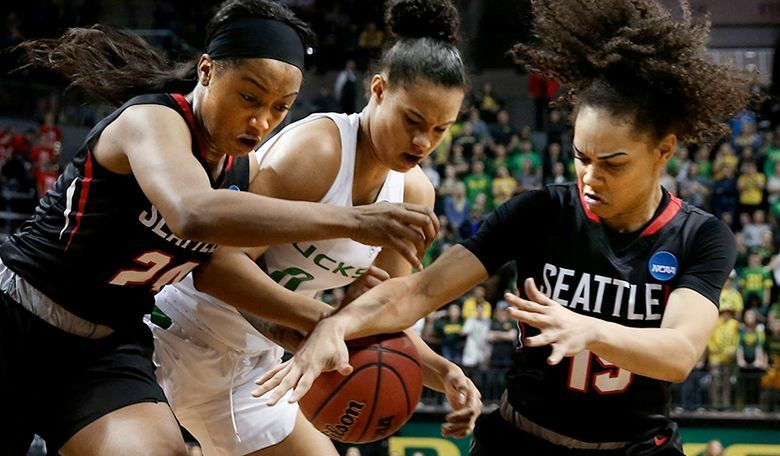 EUGENE, Ore. — Seattle University’s historic season ended abruptly at Matthew Knight Arena Friday afternoon, as the Pac-12 champion Oregon Ducks (31-4) pulverized the upstart Redhawks 88-45 in the opening round of the NCAA tournament. Yet, as the final buzzer sounded, the Redhawks players on the bench raced onto the court to greet their teammates with smiles. Despite the blowout loss to No. 2 seed Oregon, the Redhawks will remember this season for all the firsts it delivered – first WAC tournament title, first NCAA appearance in school history, first WAC team to have its players win back-to-back freshman of the year awards. The NCAA tournament rookies were jittery when they took the floor against Oregon, and it showed painfully in the opening quarter. The Redhawks (18-15) opened the game with four straight turnovers. “The emotions got the best of us at first, and then we were able to calm down and play our game a bit,” said Seattle U senior Alexis Montgomery. Seattle U finished with a 32.3 shooting percentage, and made 3 of 12 field goals in the opening quarter. “I think Oregon played to their potential,” Barcomb said. “I think we were a little bit nervous about being in the dance for the first time in school history. And it was pretty evident in the first quarter, when I think the rim was about the size of a penny for us, and it looked to be about as huge as a peach basket for Oregon. Seattle U’s early turnovers and cold shooting proved to be its undoing. The Redhawks allowed seven points off six turnovers in the first quarter, and were bullied by Oregon early as back-to-back steals resulted in layups to give the Ducks a 6-0 lead. Seattle U couldn’t keep pace and went 1 of 19 from long range. Oregon also dominated the smaller Redhawks inside, scoring 54 points in the paint to Seattle U’s 26, and outrebounding Seattle U 45-26. The Ducks rolled to a 10-0 lead in the first five minutes, and Seattle U did not get on the scoreboard until Montgomery hit a layup with 4:51 left in the first quarter. It was another eight minutes before Seattle U finally got into double digits with a jumper from Jacinta Beckley at the 7:44 mark of the second quarter. But by that point, the Ducks had already amassed a commanding 17-point lead. They led 48-16 at halftime, and expanded that to an insurmountable 70-32 advantage by the end of the third quarter. Most of Oregon’s starters stayed on the bench for the fourth quarter. With 19 points, 10 rebounds and 11 assists, Oregon’s Sabrina Ionescu recorded her NCAA-record 10th career triple-double. It was also the 16th triple-double in NCAA tournament history, and the first in Oregon school history. She left the game to a standing ovation with 8:01 remaining and Oregon up 74-36. Five Ducks scored in double figures, including Spokane native and Gonzaga Prep alum Oti Gildon, who came off the bench to have 16 points and six rebounds. Seattle native and Lakeside High alum Kallin Spiller had 10 points for Seattle U, while Montgomery led the Redhawks with 14 – though all but two of her points came in the second half, after the game was already out of hand. The Ducks next face 10th-seeded Minnesota in the second round on Sunday at 7:30 p.m. The Gophers upset No. 7 seed Green Bay on Friday afternoon to set up a clash of two high-scoring teams. Minnesota averages 85.2 points per game, while Oregon has averaged 81.9.